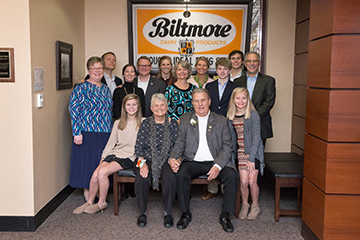 In a small ceremony, the day before Thanksgiving, Samford University honored the Crouch family for their significant contribution to McWhorter School of Pharmacy. The combined gifts of children of Phillip and Sandra Crouch established an endowment that names the Crouch Family Pharmacy History Gallery and creates a scholarship in honor of their parents. The ceremony honored Phillip Crouch, a retired pharmacist, and Sandra Crouch, a retired nurse. Phillip owned Crouch’s Ideal Drug Store in Asheville, North Carolina from 1971 to 1997, and the store was previously owned by L.G. Crouch, his father. The gallery was originally dedicated in February and it includes various donated pieces from alumni and friends and the Robert Thom collection of “Great Moments in Pharmacy.” It now includes the original sign from Crouch’s Ideal Drug Store. “As I think about this moment and about what your family has done here, I’m also conscious of the fact that there is an institutional family here as well. We tend to think that Samford is a family, and I think it is a good analogy. It’s a sweet thing for me to recognize that the Crouch Family is joining—in a significant way—the Samford family today. We are grateful for that, and we want to honor you, your relationship and your life’s work,” said university president Andrew Westmoreland. Along with Westmoreland, Nena Sanders, vice provost of the College of Health Sciences, Randy Pittman, vice president for University Advancement, and several members of the Crouch family, including children, spouses, and grandchildren were present for the ceremony. The family’s donation is part of Forever Samford, the university’s $300 million, multi-year fundraising campaign.